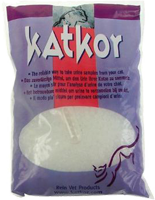 Katkor is a non-absorbent litter kit containing litter beads, a plastic pipette to enable urine sample collection and a test tube to store and transfer the urine to your vet. 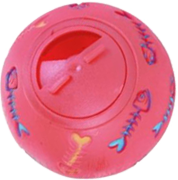 The Buster Pill Giver with a soft tip provides a way of easily administering tablets to your cat without losing your fingers! Pop your cat’s favourite treats into a Snacky Treat Ball and watch them figure out how to release the tasty snacks. 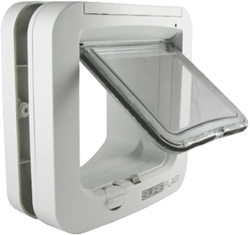 This cat flap is compatible with all common microchip types and can store up to 32 cats in memory. The cat flap is battery operated although a mains adapter is available at extra cost. 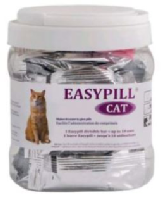 Easypill cat putty makes it easier to give pills to your cat as the delicious, flavoured treat hides the tablet completely. The Premo blue/green grooming comb helps to keep your cat’s coat tangle-free and looking healthy. The Premo blue/green flea comb helps remove fleas, flea eggs, scurf and dust effectively from your cat’s coat. 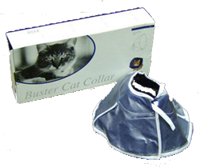 The Buster Soft Collar is an inexpensive solution to prevent you cat from reaching wounds on its head or body. These collars are manufactured from a soft, non-woven material which is water-repellent and easy to clean.